Just when I thought I was content with my fitness tracker, along comes the undeniably genius Vitali Smart Bra to change my mind. Unlike a Fitbit however, the Vitali Smart Bra tracks your wellness, and let’s face it – less stress is more important to many of us than how many steps you’re clocking up a day. 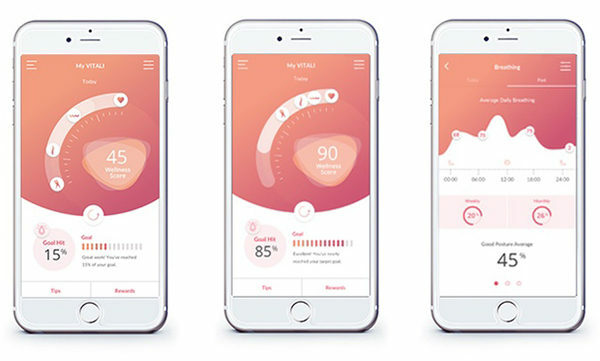 Tracking your breathing, posture and heart rate variability, the Vitali Smart Bra is indeed smart. Keeping check of the balance of stress and your wellbeing, when an unbalance is first detected you’re prompted to take action to bring the balance back into check, backing away from the stressful edge. How does a bra know all of this, you ask? It has fabric based sensors that collect all of your vitals. The bra is also home to a gem – aka the intuitive mind of the bra – giving you real time feedback through vibration to take a deep breath or sit up and stretch. For curiosity’s sake, you can even check your real time feedback along with a host of other stats via the handy My Vitali Wellness Centre app. If you think you’d benefit from a bra which encourages wellness and mindfulness (and frankly, who wouldn’t? ), hop on over to the Vitali Kickstarter campaign and make a pledge. You can score yourself a Vitali Smart Bra for just $129 if you nab yourself the Early Bird Special deal!